“There is only one rule – Solidarity”. This statement sums up the philosophy of the now globally famous Berlin based crew, 1UP. 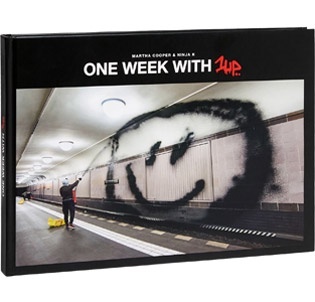 “1 WEEK WITH 1UP” is the epic book result of photographers Martha Cooper and Ninja K, documenting and moving with the 1UP Crew for 1 week of sleepless nights and heart pounding action. See the result of creative teamwork at it’s best as 1UP uses its complex network of members and helpers, who all do there part to ensure everyones safety and the success of the mission. One Week with 1UP" is a unique photography and art project created by the legendary New York photographer Martha Cooper, the Berlin-based photographer Ninja K, and the world-famous Berlin graffiti crew 1UP (One United Power). The book explores a unique bond between the renowned documentary photographer – who, since the 1970s, has captured some of the most enduring images of the graffiti and hip-hop scenes – and one of world's largest, most fearless modern-day graffiti crews. 1 WEEK WITH 1UP is 144 pages laced with 30 different stories that all took place within a week. 180 images document the dedication, determination and persistence of one of the worlds most widely spread graffiti crews. 21st Century writing at its best showing work created in tunnels, roofs tops, on the streets, high-pressure fire extinguisher tags, roll-downs, street bombing and whole-cars.